Sophia Town Hall is located at 100 East Railroad Avenue, Sophia, WV 25921; phone: 304-683-4456. Photo: Main Street, Sophia Historic District, Sophia, West Virginia. 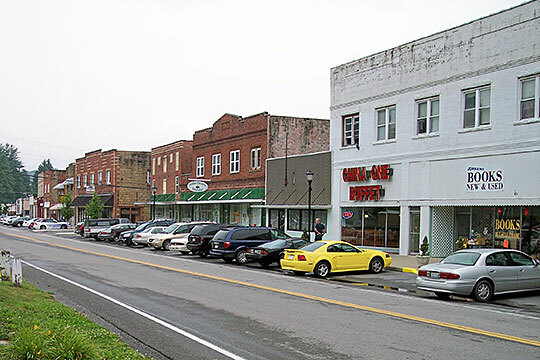 The Historic District was listed on the National Register of Historic Places in 2006. Photographed by Tim Kiser, 2007, (own work) [cc-by-2.5 (creativecommons.org/licenses/by/2.5)], via Wikimedia Commons, accessed July, 2013. Sophia, originally called Soak Creek, was established on wilderness farm land owned by Pyrrhus McGinnis and Conrad Riffe, which stretched along Soak Creek valley. Pyrrhus McGinnis, a merchant, was listed in the 1850 landbook as landowner of Soakass and Crab Orchard Creek for 11,628 acres. Soak Creek received its name from a somewhat humorous incident. A hunter in a group of hunters on McGinnis and Riffe's farm slipped into a stream and became soaked with water, thus the area name, Soakass Creek. Those that lived in the area kept the name for many years, but as new settlers moved in they changed the name for obvious reasons to Soak Creek. The town was first inhabited by Pyrrhus McGinnis, a pioneer who received a land grant of 2500 acres from the Commonwealth of Virginia. Pyrrhus moved his family to what was then Fayette County in the spring of 1843 into a log cabin he had built with the help of his son, Achilles McGinnis in the previous fall of 1842. McGinnis eventually sired a long line of Raleigh County lawyers. And the town was eventually named for his third wife, Sophia. Another settler on Soak Creek was Conrad Riffe, who also received a grant of land at the head of the creek and moved there in 1843. The Raleigh Register June 16,1910 article titled, "Bit Auction Lot Sale Has Been Announced for Sophia on the Winding Gulf," noted that Sophia is a new point on the Winding Gulf Branch of the Virginian and is a strategic point which will undoubtedly within a short time develop into a thrifty town. There were few opportunities for towns to develop in the area because most of the land was owned by the coal companies except for the land in the Soak Creek area, which was owned by individuals. There was never a town plan for Sophia, thus it was built where there was water. The Sophia Historic District is stretched out along Main Street, bordered by Polk Street on the West and Riffe Street on the East, land originally owned by Henry Riffe and Daniel Polk. Ms. Joellen A. Kerr, University of Charleston and State Historic Preservation Office, Sophia Historic District, Raleigh County, West Virginia, nomination document, 2005, National Park Service, National Register of Historic Places, Washington, D.C.